April 19 statement from Cynthia Cornelius, M.D., M.P.H. On Wednesday, I informed you of a probable case of meningococcal meningitis at San Diego State University. Since my original email, San Diego County Health and Human Services Agency officials have confirmed the diagnosis and that this case was caused by serogroup B meningococcus. For privacy reasons, no additional information about the infected student is being provided. Additional testing is taking place to determine if this new case is connected to the outbreak that county public health officials declared at SDSU in October 2018. At this point, we cannot say whether or not the current case is connected. It will take several weeks before we have this information. We will share updates as soon as they become available. This week we urged certain members of the campus community to seek preventive treatment as they were identified as having attended events during which the infected student was present. Since fall 2018, we have continued to strongly urge all undergraduate SDSU students 23 years of age or younger, who have not yet been fully vaccinated for serogroup B meningococcal disease to receive one of the meningococcal B vaccines (MenB), Bexsero or Trumenba. As a reminder if you only received one dose, you are not fully protected. 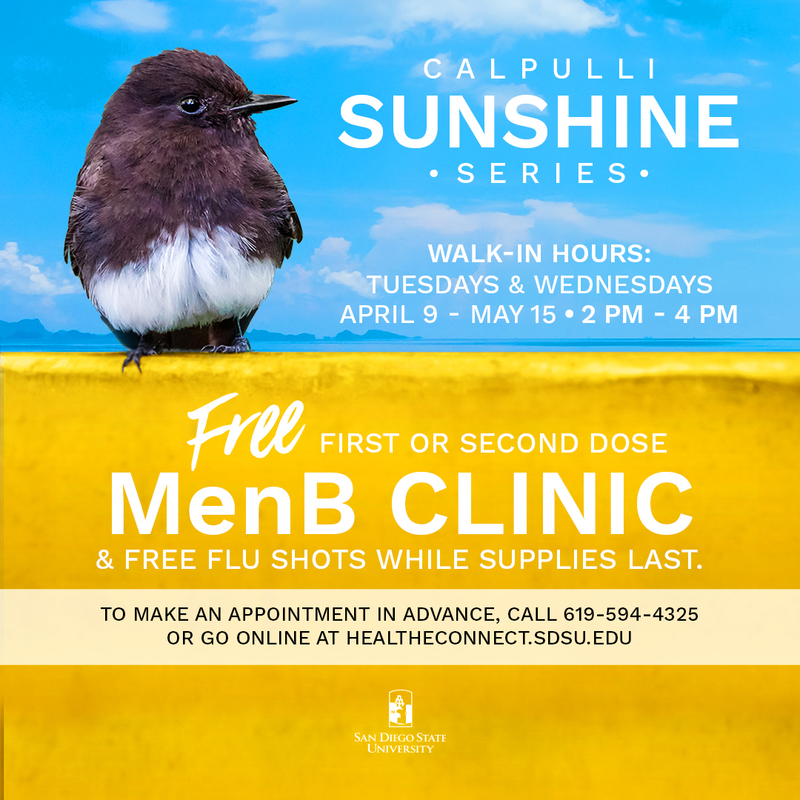 As SDSU’s primary concern is the safety and well-being of all campus community members, we are offering our next pop-up Free MenB vaccination clinic on Tuesday, April 23, at the Calpulli Center from 11 a.m. to 4 p.m. We ask that students please bring a valid photo identification card and RedID to the vaccine clinics at SDSU. Additionally, students can obtain the free vaccine at Student Health Services with a scheduled appointment or during the standing walk-in MenB clinics, held Tuesdays and Wednesdays from 2 to 4 p.m. Students can also receive the vaccine from their primary care provider or at a local pharmacy. Meningococcal disease symptoms may include fever, intense headache, lethargy, stiff neck and/or a rash that does not blanch under pressure. Anyone with potential exposure who develops any of these symptoms should immediately contact a healthcare provider or emergency room for an evaluation for possible meningococcal disease. Also, the bacteria can be spread through close contact, such as sharing drinking glasses, eating utensils, cigarettes or pipes, or water bottles; kissing; and living in close quarters. The time between exposure to the disease and the onset of symptoms can be between two to ten days. Call Student Health Services at 619-594-4325 if you have questions. More information will be forthcoming as we learn new information about the most recent case and its implications for the campus community. Also, as you have questions, call Student Health Services at 619-594-4325. More on the most recent meningitis news click here. and FREE flu shots while supplies last. To make an appointment in advance, call 619-594-4325 or go online to healtheconnect.sdsu.edu. Check out our videos to learn more about Meningococcal B. Learn more about how meningitis impacts students and their families by watching the videos below. San Diego State University is continuing its efforts to support the health and safety of the university community following an announced Meningococcal B outbreak. Since the outbreak was announced in October 2018, the university, in partnership with the County of San Diego Health and Human Services, has vaccinated thousands of students against the disease. In addition, many other students went to their health-care provider or a local pharmacy to receive the vaccine. SDSU is asking all students 23 years of age and younger to check their immunization records and to get vaccinated for MenB – a potentially fatal disease spread through close contact with those who are ill. The effective vaccines for MenB are Trumenba and Bexsero, which were approved by the FDA in 2014-15. Many students did not receive them while in high school but did receive vaccines for other meningitis serogroups. MenB is life-threatening. Prompt diagnosis and treatment is critical because the disease progresses rapidly and can be fatal in as few as 12 hours after symptoms that often resemble influenza. Click here for FAQs on MenB. Where can I get the 2nd vaccine dose?